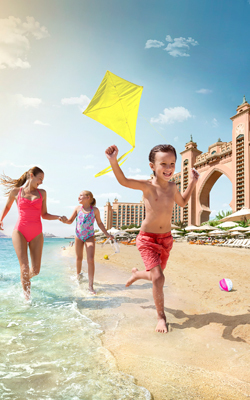 Awarded the best 5-star family hotel in the Middle East from Arabian Travel Awards and Holiday with Kids Magazine, Atlantis is a unique vacation and versatile family entertainment destination with fun things to do and so many options for you to choose from. With stylish guest rooms and the most luxurious suites with Imperial Club access, a world of family friendly attractions, an award-winning spa and fitness centre, delectable gourmet dining experiences at more than 20 restaurants, world class meetings and events facilities, exhilarating experiences on a water-themed playground, you will find a world away from your everyday at Atlantis Dubai. 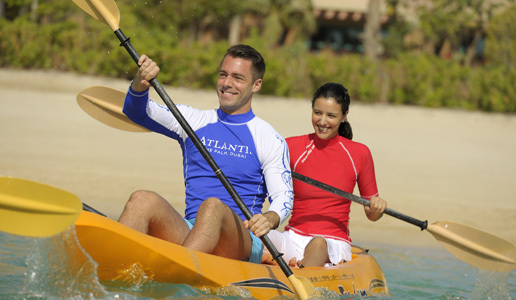 Accommodate yourself and your family in one of the 1,500 luxury rooms at Atlantis. Each room features a private balcony overlooking the ocean or The Palm, while all suites at Atlantis include Imperial Club Lounge access and many exclusive benefits. You can upgrade your stay to a high-end luxury travel experience for little and enjoy everything – from Priority check-in and check-out for you and your family at our dedicated private lounge, The Royal Majlis and exclusive personal concierge service throughout your stay, to complimentary full breakfast and two-for-one spa treatments at ShuiQi Spa & Fitness – and all the other benefits of the exclusive Imperial Club Lounge. Take the morning to lounge around the Royal pool. Turn your pool day to an all new level of relaxation and book your private cabana. Equipped with lockers, magazines and butler services, a private cabana is the way to relax and unwind while soaking up some sun. If you prefer other leisure activities, head to the private beach to enjoy a range of watersports including banana boats and donut rides, water-skiing and wakeboarding, stand up paddle boards, kayaks, and more. Make new friends at one of the most sophisticated marine habitats on the planet, interact with charming Indo-Pacific bottlenose dolphins at Dolphin Bay or cuddle with our furry South African fur seals at Sea Lion Point. We promise you, it will be an experience you cherish forever! Dolphin Bay is a 4.5-hectare enclave complete with seen interconnected resident pools and three crystal clear interactive lagoons in a tropical setting, offering the perfect location for a once-in-a-lifetime experience with the largest coastal dolphin habitat in the world. From a brief encounter in shallow water to scuba diving or swimming with dolphins and a guided behind the scenes tour with our qualified Marine Mammal Specialists, there are a choice of dolphin experiences suitable for all ages. Not far away from Dolphin Bay is Sea Lion Point, a sophisticated sea lion enclosure that houses the South African fur seals. Walk into waist-deep water to experience a close encounter with theses utterly charming sea lions and enjoy cuddles while learning what makes these marine mammals so unique with the help of marine mammal specialists. Non-swimmers are also welcome to participate in the interactions as it takes place in shallow water. 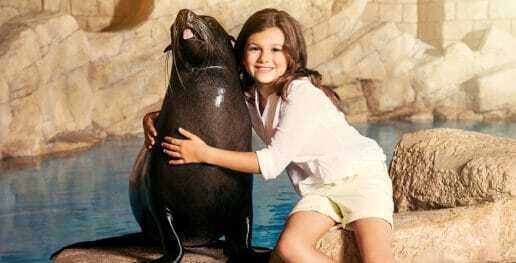 If you prefer to stay dry, you can snap a photo with the sea lions, and enjoy a hug or kiss on dry land with the Sea Lion Photo Fun. To enjoy poolside dining, head on over to The Edge where you can relax and cool off with our tasty drinks and signature dishes. Don’t miss the weekend BBQ with fresh seafood, sizzling meat on the grill and live entertainment giving everyone enough reasons to get outdoors with family and friends. The newly opened family entertainment venue in Dubai puts a spin on the definition of dining, entertainment and nightlife. From a four-lane bowling alley, to a wave machine and more, there is something for everyone at Wavehouse. The restaurant and bar provides a mouthwatering selection of lunch, dinner and snacks to suit every taste. Bowl a few strikes at the Bowling Alley with your family, while you have a beer and enjoy the lively atmosphere. Enter LEVELS at Wavehouse where there are more than 50 games for the young or simply young at heart to play. Those looking to spend a chilled-out afternoon in the sun can enjoy the terrace overlooking the ultra-modern Wave Rider machine. As the sun goes down, kick-back for an evening of eats, beats and entertainment with live bands, DJs and a host of special events throughout the week. 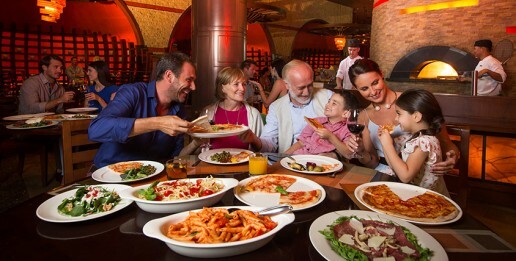 After a fun-filled day out and about, treat the family to an authentic sharing-style Italian dinner at Ronda Locatelli. With ingredients sourced from Italy and an Italian chef who cooks pizza and pasta with his heart and soul, only to satisfy your taste buds. Enjoy the stunning views of our iconic Atlantis resort, come eye-to-eye with world famous Dubai attractions and see the iconic Palm Islands from a fresh perspective in this unique city tour/viewing experience. 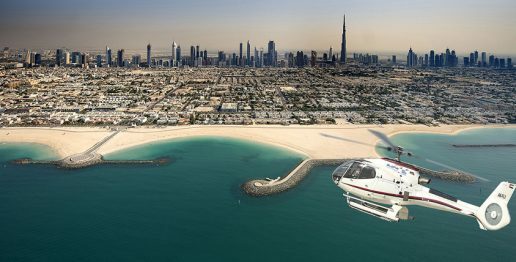 There are many helicopter tour options available at Atlantis; choose from a 15-minute Fun Flight Tour to a sensational 60-minute Dubai sightseeing tour, explore landmarks and attractions such as the amazing Palm Jumeirah, Burj Khalifa, The World Islands, Dubai Marina, Sheikh Zayed Road etc. The Shore provides satisfying Tex-Mex cuisine straight from the grill, with fajitas, taco’s and nachos. Pull up a chair at the bar and enjoy a range of signature cocktails and margaritas, all served against the picturesque backdrop of the The Palm and Dubai skyline. 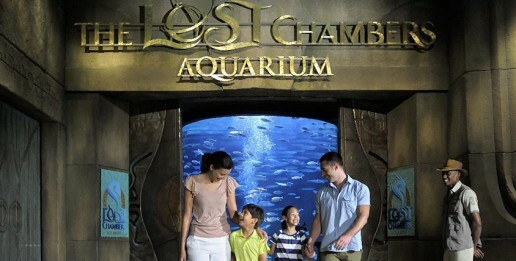 Home to one of the largest marine habitats in the Middle East, The Lost Chambers Aquarium gives a valuable insight into the Atlantean history as well as information about the marine life. With more than 20 marine exhibits to explore and more than 65,000 marine animals to marvel at, you can experience the myths of Atlantis coming to life through the passageways and tunnels of The Lost Chambers Aquarium. Take a guided tour of the aquarium and watch an interactive Aquatheatre show. The Ambassador Lagoon provides a window into the ruins of the ancient city of Atlantis, mesmerizing guests as a stunning display of fish, stingrays and sharks gracefully glide through the relics of this long-lost civilization. Whether you are a beginner or an accomplished diver, you can enjoy a Dive Discovery in the Ambassador Lagoon. Atlantis Dive Discovery is specifically designed for non-certified divers. Learn basic diving skills and meet our sharks, rays and colourful fish amongst the ruins of Atlantis. 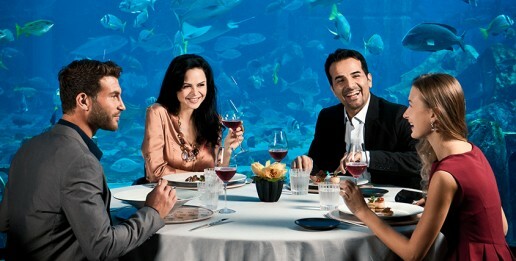 Enjoy an exquisite dining experience in one of the hottest dining venues in Dubai. Redefining Japanese-Peruvian cuisine, Chef Nobu Matsuhisa’s NOBU offers exquisite dishes and features and classic sushi bar and a garden sanctuary Matsuhisa’s. 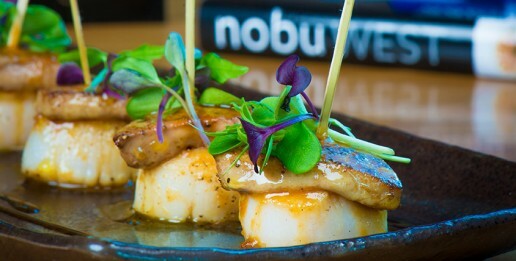 Must Try – Signature Miso Cod, a favourite of the celebrities who frequent the restaurant. Within the resort there are 40 boutiques, to keep shopaholics satisfied. 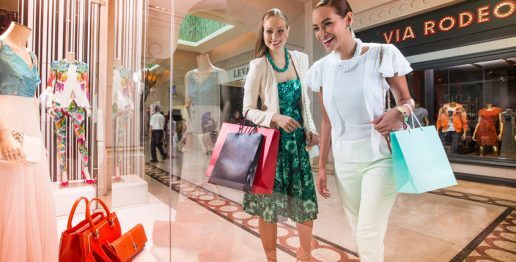 From the latest international fashion labels to luxury jewellery, the shopping experience is second to none at The Shopping Avenues. Begin your retail therapy with high-end boutiques selling a range of products including designed label fashions, beach attire, cosmetics and children’s clothing and toys. There are many souvenir shops around the resort to ensure that you find trinkets and memorabilia from Aquaventure, Dolphin Bay and The Lost Chambers Aquarium to take home with you. Brands include Georg Jensen, Chopard, Paspaley, Tiffany & Co, Levant, Porsche Design and Rolex, to name a few. Within the hotel there are 40 boutiques, to keep shopaholics satisfied. From the latest international fashion labels to luxury jewellery, the shopping experience is second to none at The Shopping Avenues. Begin your retail therapy with high-end boutiques selling a range of products including designed label fashions, beach attire, cosmetics and children’s clothing and toys. There are many souvenir shops around the resort to ensure that you find trinkets and memorabilia from Aquaventure, Dolphin Bay and The Lost Chambers Aquarium to take home with you. Brands include Georg Jensen, Chopard, Paspaley, Tiffany & Co, Levant, Porsche Design and Rolex, to name a few. Your holiday wouldn’t be complete without a relaxing massage at ShuiQi Spa. Walk in the earth-hued natural stone steps along steaming water pathways to one of the 27 treatment rooms where you can find an ideal and personalised treatment or therapy. Our talented specialists focus on muscle tension, joint mobility and circulation. Take your spa session one step further with ESPA’s hot stone treatment or a blissful, tension-releasing synchronised massage, followed by an exclusive foot and nail treatment at Bastien Gonzalez. 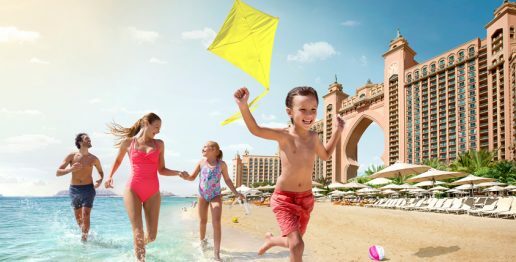 When you need a break from your kids, leave them at Atlantis Kids Club where there are plenty of complimentary kid-focused programmes available for kids from ages 3 to 12 years. 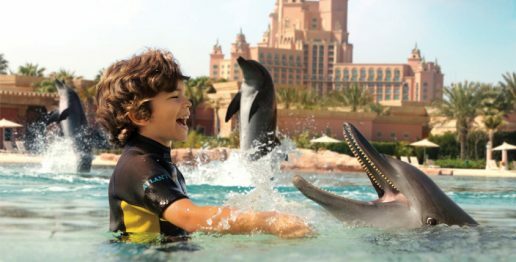 As the stellar hub of kids’ activities, with morning, afternoon and evening sessions, the Atlantis Kids Club offers recreational experiences and fills your little one’s day with a variety of age-focused entertainment and refined thrill. If your hard-to-please teens are looking for the freedom to be themselves, take them to The Zone, the ultimate teen-only hangout, where they can chill, play, dance, sing, read, connect and make new friends from the around the world. The Zone offers a dedicated space where they can chill out with the latest in digital gaming – PlayStation, Xbox and iPad games among other activities that are sure to liven up their day and night at Atlantis. Enjoy a sumptuous dinner at Ossiano, an award-wining seafood restaurant and the best romantic restaurant in Dubai, with stunning views of the Ambassador Lagoon, making it a lavish dining experience at Atlantis. 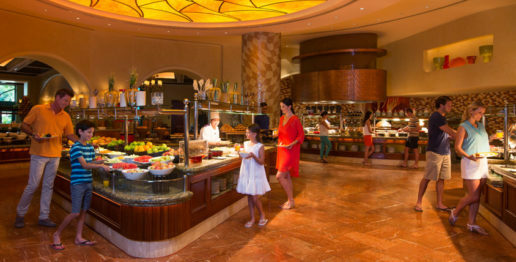 Try the elaborate breakfast buffet at Kaleidoscope, where you can taste cuisines from India, Italy, Arabia and the Mediterranean. There are interactive kitchens with live cooking stations where you can witness your meals being cooked right before your eyes. 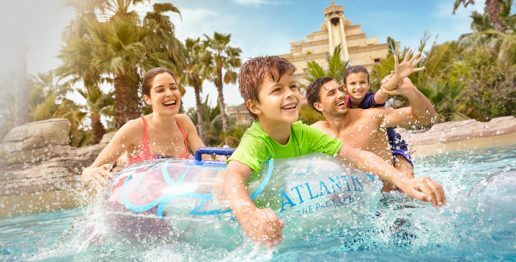 Explore the Aquaventure Waterpark, the No. 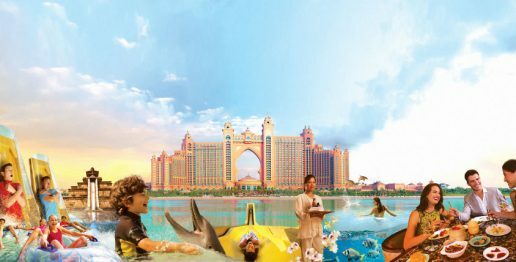 1 waterpark in Europe and the Middle East, comprising of 17 beachfront hectares along The Palm’s crescent, and two enormous towers packed with world-record breaking rides and heart-thumping attractions. The waterpark can overwhelm you with an array of unique, not-to-be-missed waterslides and extraordinary rides with cascades, tidal waves and rapids. And since the waiting lines to the rides can be long during the half-term, you need some good planning to cover all the rides and attractions at the venue. 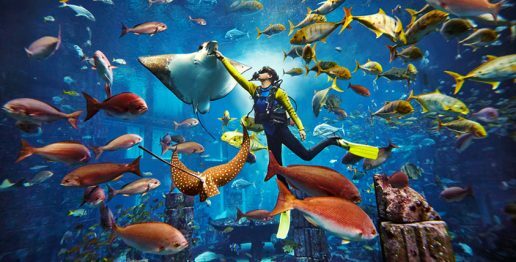 Take the Leap of Faith; the adrenaline-pumping ride plummets you through a nine-story-tall mega slide in a near-vertical fashion in five seconds, into a transparent tunnel that has Cownose rays and sharks swimming around it. 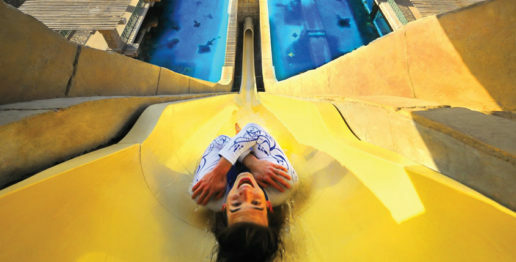 If the thought of sharks swimming alongside thrills you, then Shark Attack is just right for you. The fun ride is suitable for both kids and adults, and will send you sliding down an inner-tube ride only to land in a lagoon filled with sharks! Try the popular water coaster ride takes you through a combination of unexpected drops and lifts straight down a maze of dark tunnels that opens into the lazy river where you can enjoy over 2 kilometres of river rapids. Children can play at Splashers Island with a variety of water slides and games designed just for kids. 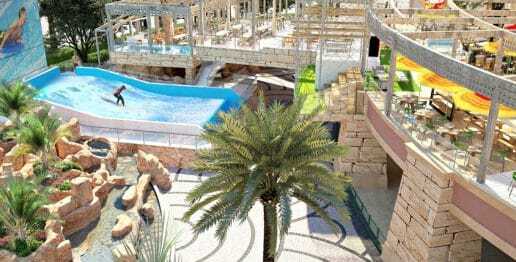 Aquaventure Waterpark has more than 15 restaurants and kiosks offering a wide variety of meals, snacks and refreshments. There is always something quick, fresh and delicious on offer to suit every palate. 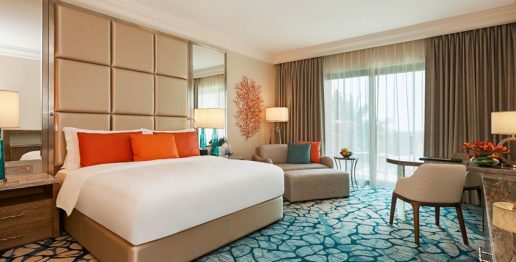 Here are some exceptional savings to take advantage of while booking a stay at a room or suite of your choice – take a look at all Atlantis Dubai Offers available to you and enjoy amazing rooms & suites discounts. Take advantage of the Emirates Skywards offer to save on luxurious stay and enjoy a host of resort-wide attractions, while increasing your Skywards Miles. As an Emirates Skywards member, you get 15% off the best available rate for a Guest and Imperial Club room, plus double Skywards Miles, and 20% off the best available rate for a Club and Signature Suites, plus triple Skywards Miles. Kids stay, dine and play for FREE throughout their stay! As a UAE resident, take advantage of UAE Residents Special Offers crafted exclusively for you. 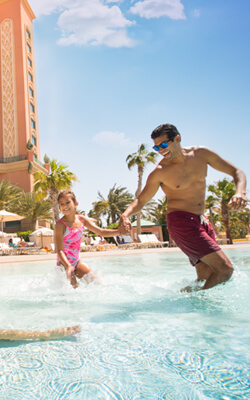 Book and Save Up to 20% on Your Stay at Atlantis, The Palm – Make your staycation more exciting with 20% off Best Available Rates on your stay at Atlantis, The Palm. Enjoy a Full Day of Luxury Spa Pampering for Only AED 550 at ShuiQi Spa – TryShuiQi Spa’s exclusive Pamper Me by Aromatherapy Associates package for a full day of pure indulgence that includes: a 75-minute Aromatherapy Associates treatment and massage session (from head to toe) for both men and women; scrummy lunch at The Edge or The Shore; special access to Royal Pool, Zero Entry Pool and Royal Beach; 10% discount on ESPA products. 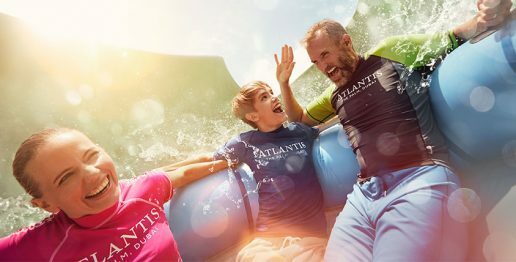 Whether you want an action-packed adventure with the whole family or a romantic, relaxing getaway for two, Atlantis will definitely give you a holiday of a lifetime.